Ahhh, the hub of rural life. 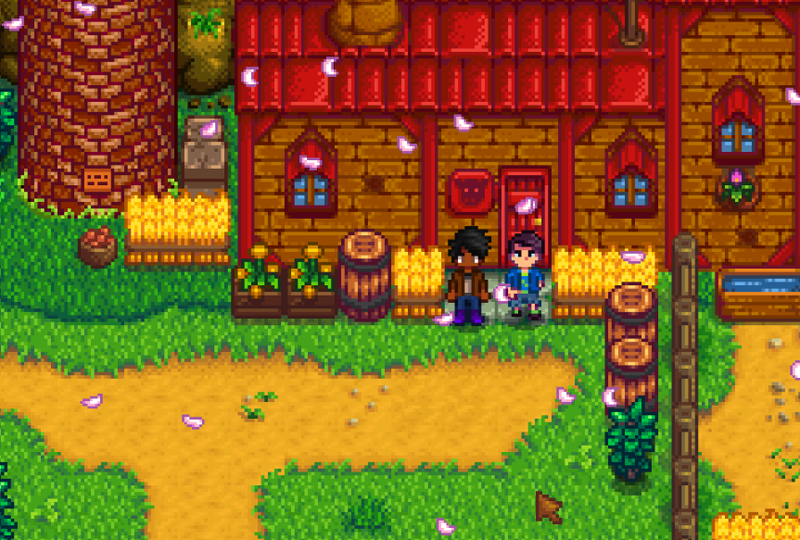 Pelican Town is the closest you'll get to a social life while playing Stardew Valley: Its residents are, on the whole, calm, polite, friendly people, and they're (usually) more than happy to engage with your farmer as he or she goes about his or her business. 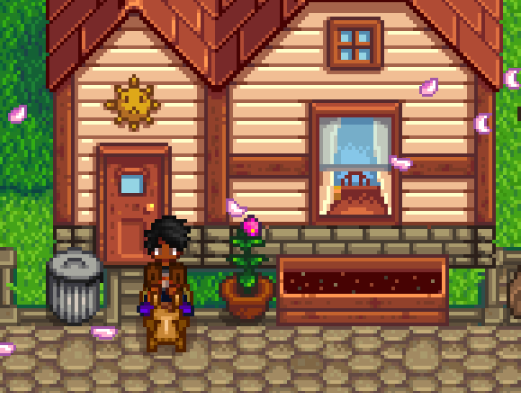 Pelican Town is a staple of Stardew Valley, and even if you decide to avoid interpersonal relationships you'll still have to go there fairly often. 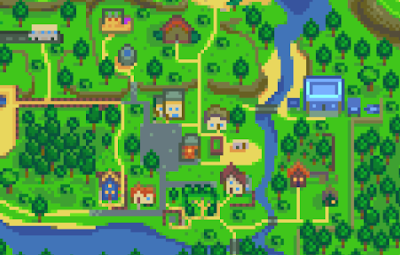 Pelican Town is located to the east of your farm, though there are elements of the town to the north and south as well. For such a small community Pelican Town provides you with plenty to see and do, and much of your life in Stardew Valley hinges on meeting the people and getting to know as many folks as you can. Pelican Town is open at all times of the day. The buildings within it, however, are not. Below is a quick overview of each of the businesses and homes you can find in and around Pelican Town. 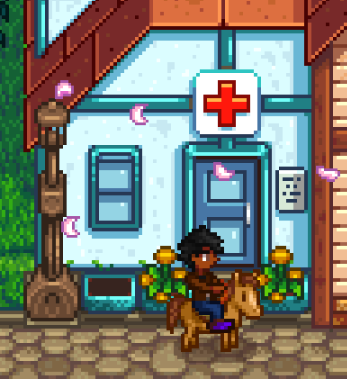 Harvey lives in the Clinic, and Maru can occasionally be found working the desk as well. The Clinic is open from 9 am until 3 pm each day. 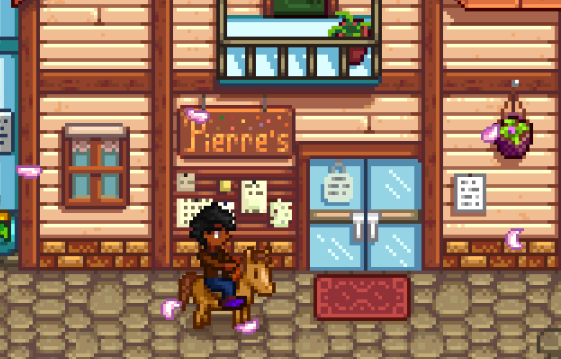 Your primary source of goods in Pelican Town is Pierre's General Store. 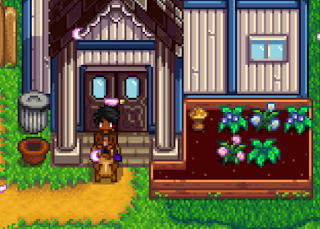 Among other things, Pierre will sell you the Seeds you need to plant crops on your farm, and his stock will rotate with the seasons. Pierre operates the store from 9 am until 5 am on every day except Wednesday. Pierre, his wife Caroline, and his daughter Abigail all live in the General Store. On Tuesdays several of the women of Pelican Town enter the Store to work out for a few hours, and on Sundays a few residents will pray in a small shrine at the rear of the Store. Just south of Pierre's General Store is the Stardrop Saloon. 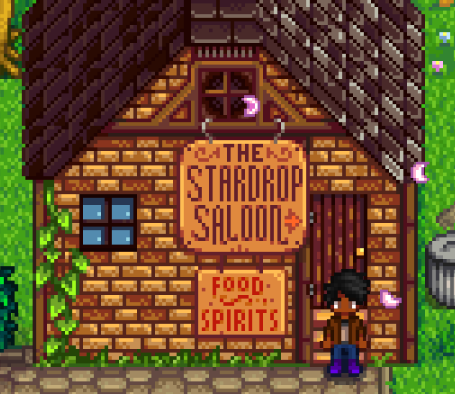 This little staple of recreational living is the go-to spot for many of Pelican Town's residents after a long day of work, and some of them lounge in the Saloon every evening. The owner, Gus, lives in the Saloon and works alongside his part-time waitress Emily. The Saloon is open from 12 pm to 12 am every day. Pierre's primary competitors. 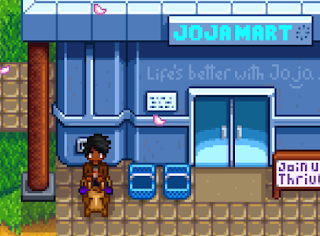 JojaMart is a Wal-Mart-esque grocery store in the northeast of Pelican Town, offering virtually everything Pierre offers at inflated prices. 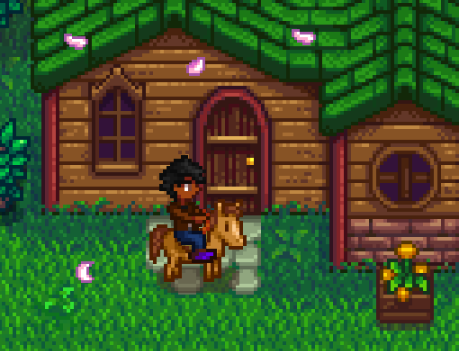 They are the 'bad guys' of Stardew Valley, insofar as this game has bad guys. Shane works here every day, and Sam shows up for sweeping duties a few days of the week. JojaMart is open from 9 am until 11 pm every day. If you complete all of the Bundles in the Community Center JojaMart will be closed permanently. Not a huge loss, honestly. 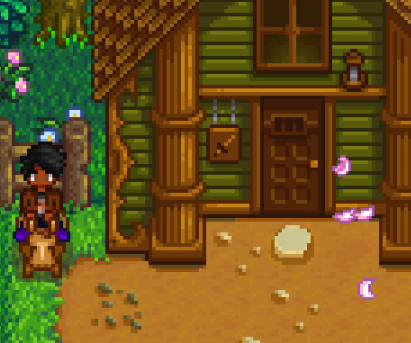 Stardew Valley's one and only metalsmithing provider, the Blacksmith offers a range of services, from upgrading your tools to cracking open valuable Geodes. Located south of JojaMart, the Blacksmith is operated by Clint from 9 am until 4 pm each day. Clint also lives here. The bastion of learning hereabouts. 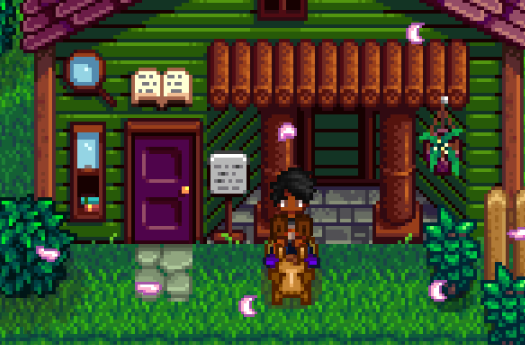 The Stardew Valley Museum & Library serves as a place of knowledge and prizes, as you can donate Lost Books, Artifacts, and Minerals to the owner, Gunther, in exchange for valuable information and an assortment of useful items. 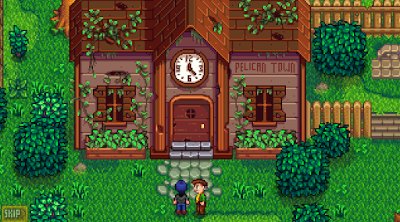 The Museum & Library is also a less-populated hub of activity, and many of Pelican Town's residents will visit the building throughout the year. The Museum & Library is open from 8 am until 6 pm each day. Though not a business per se, the Community Center is nevertheless a place of transaction. 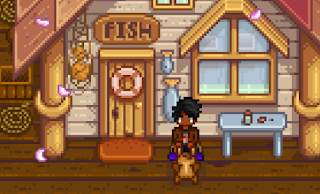 Located in northern Pelican Town, the Community Center is, normally, abandoned by the populace - though with the help of a group of resident forest creatures, you can bring the Community Center back into prominence. The Community Center is open at all ties. If, however, you purchase a Membership with JojaMart, the Community Center will be converted into a relatively useless warehouse, sealing off all opportunities to restore the building to its former glory. 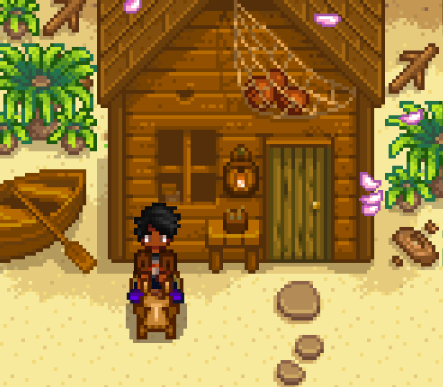 North of Pelican Town is the Carpenter's Shop. Here you can purchase upgrades for your home, as well as additional buildings for your farm. 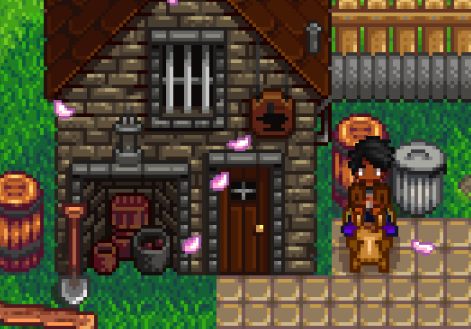 If you want to raise animals, you'll need to visit the Carpenter's Shop and give them a home first. The Carpenter's Shop is open from 9 am until 5 pm on every day except Tuesday, though you can enter the Shop from 9 am until 8 pm for visiting purposes. The Shop is owned and operated by Robin. 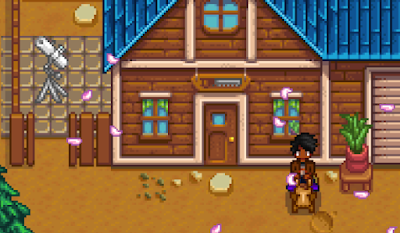 She lives there with her husband, Demetrius, and their two kids, Maru and Sebastian. 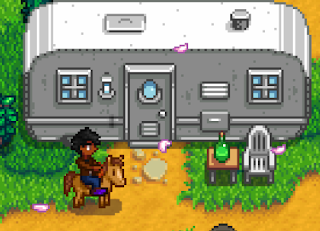 West of Pelican Town, and just south of your farm, is Marnie's Ranch. 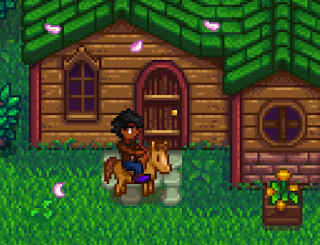 Here you can purchase an assortment of barnyard animals, assuming you've constructed buildings via the Carpenter's Shop, and a few items for maintaining said animals. The Ranch also serves as a home for Marnie, the proprietor, her niece, Jas, and her nephew, Shane. 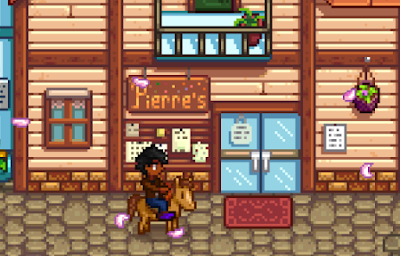 Marnie's Ranch is open from 9 am until 8 pm each day, though Marnie only operates her business from 9 am until 6 pm, and doesn't work on Mondays and Tuesdays. Located on the beach, the Fish Shop is the number one destination for anyone with a hankering for fish. The owner, Willy, will provide you with a Bamboo Pole upon your first visit, as well as plenty of supplies related to catching fish. 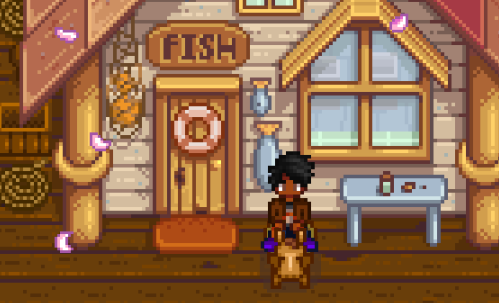 The Fish Shop is open from 9 am until 5 pm each day. 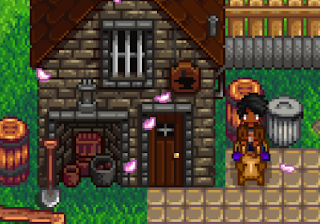 Northeast of Pelican Town, on the fringes of civilization, sits the Adventurer's Guild. Operated by Marlon, the Adventurer's Guild serves as a store and bounty-hunting outpost for the nearby Mines. The Adventurer's Guild is open from 2 pm until 10 pm each day. Located just east of Pierre's General Store, 1 River Road is the home of George, Evelyn, and Alex. (Also, a dog. Interact with Alex enough and you'll get to see the beast eventually.) 1 River Road is open from 8 am until 8 pm each day. Located south of 1 River Road, the Trailer is the home of Pam and Penny. Early in the game, before repairing the bus, you can find Pam here throughout most of the day. Many of the events with Penny take place inside the Trailer, as well. The Trailer is open from 9 am until 8 pm. Located in the south of Pelican Town, the Mayor's Manor is the home of Lewis. It is a house, and not terribly remarkable in any way. The Mayor's Manor is open from 8:30 am until 10 pm. 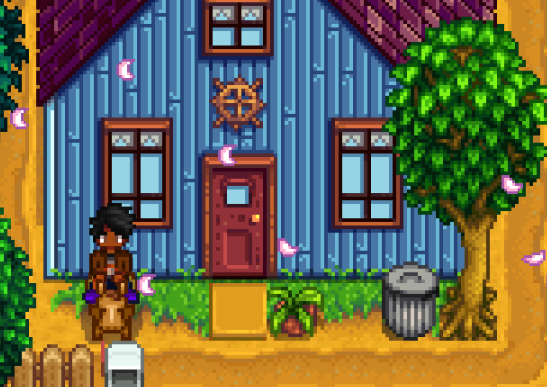 Located in the south of Pelican Town, 2 Willow Lane is the home of Haley and Emily. 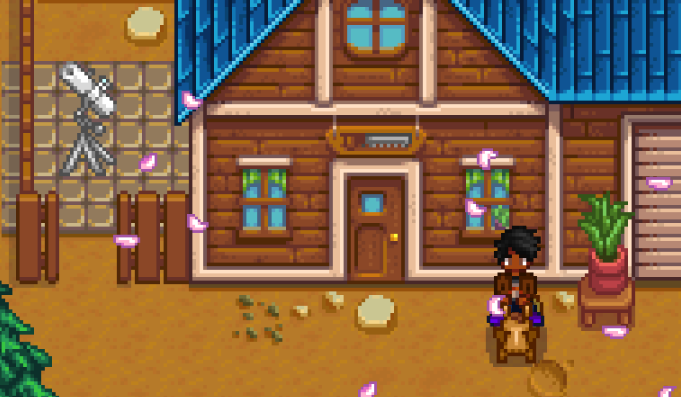 Though the majority of the house is open so long as you have befriend Haley and Emily, a dark room in Haley's room can only be accessed if you get to ten hearts' worth of affection with Haley. 2 Willow Lane is open from 9 am until 8 pm. Located right beside 2 Willow Lane, 1 Willow Lane is the home of Jodi, Sam, Vincent, and, starting in the second year, Kent. 1 Willow Lane is open from 9 am until 8 pm. Located on the beach, Elliott's Cabin is the home of Elliott. The Cabin is open from 10 am until 8 pm each day, though you can't enter until you have two hearts' worth of affection with Elliott. Located just south of Marnie's Ranch, Leah's Cottage is the home of Leah. The Cottage is open from 10 am until 8 pm each day, though you can't enter until you have two hearts' worth of affection with Leah. 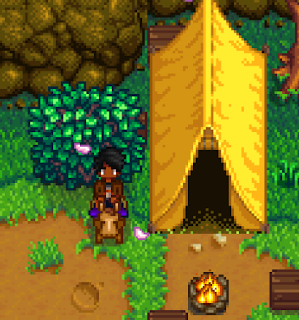 Located just north of the Carpenter's Shop, the Tent is the home of Linus. The Tent is open at all times of the day, probably because it has no front door. Graphic representation of series attracts many ones. These are playing in form of games. The complete form of graphics attract in form of games. The small graphics work in combine form of work. These cartoon pictures are so beautiful and these designs are so unique just few people who create top dissertation writing services that type of painting. This Stardew Valley the man is going to home or clinic for the checkup. thank you for sharing, please visit our website.